Did Rare manage to piece together a worthy title? 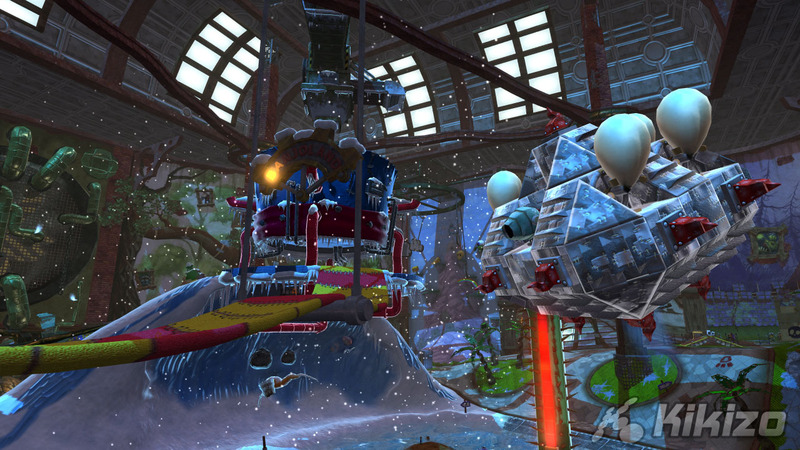 I like a game that can laugh at itself, and Banjo Kazooie: Nuts & Bolts does plenty of that. As if it wasn't enough to turf the series' platforming heritage out into the cold, Rare has also elected to mock that heritage mercilessly, kicking the fourth wall to pieces mere seconds long of the title screen. Much of the bile comes to you care of the Lord of Games, or "L.O.G. 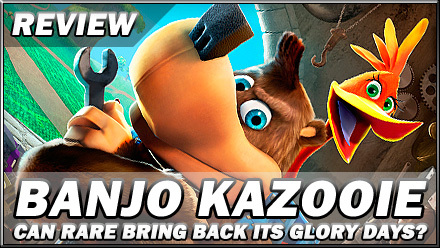 ", a self-appointed custodian of digital culture with a face only a Magnavox Odyssey could love, who quite literally pauses the action as an overweight Banjo and bird accomplice Kazooie square off against a bodiless but still thoroughly villainous Gruntilda. L.O.G. 's first thought is to have the antagonists resolve their differences by racing for ubiquitous shiny tokens, but after a painful display of out-moded mechanics, he decides to pit them against one another in a more sophisticated, hardware-intensive fashion. Starting out in L.O.G. 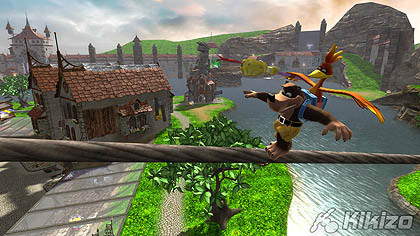 's homeland of Showdown Town, Banjo and Kazooie must win golden Jiggies by completing challenges in worlds created by their host, each accessed by way of portals around the town and divided into three or four, not necessarily consecutive Acts. 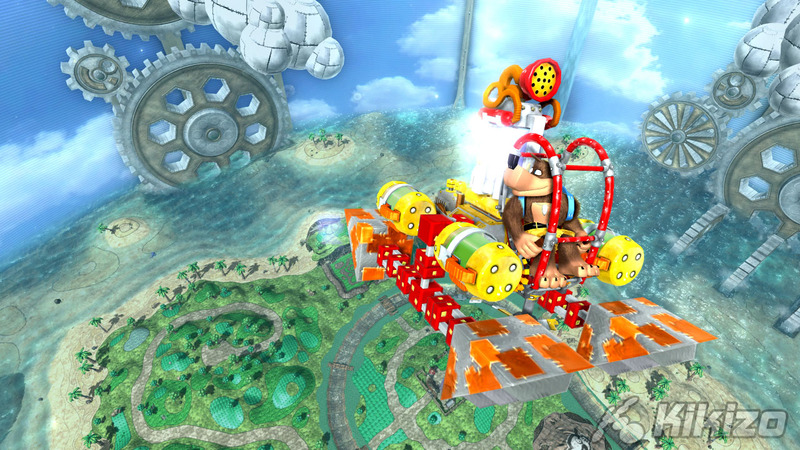 As in Super Mario 64, more worlds are unlocked with more Jiggies, and new means of getting around or combating enemies become available as you progress. 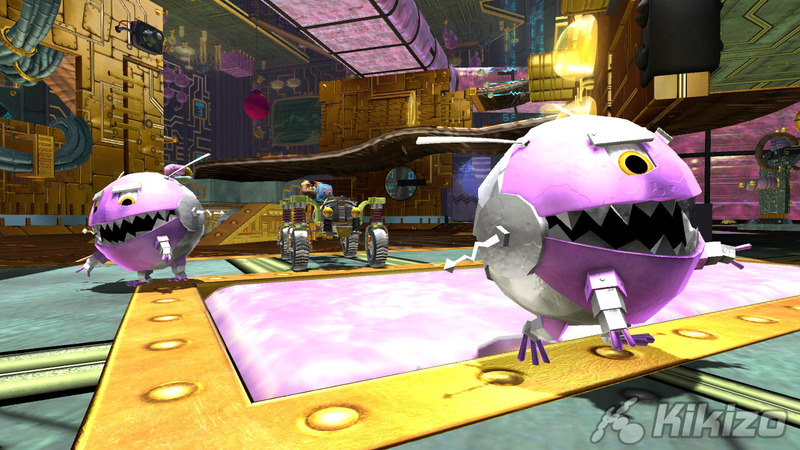 By "new means" we don't mean acrobatic abilities or transformations in the vein of Banjo games past, but vehicle components, hidden throughout the town or awarded by its residents, which can be assembled into various specimens of automotive whack at Mumbo Jumbo's garage. You're limited to a bog-standard shopping trolley (upgraded by winning boss battles against Grunty) while in Showdown Town itself, but when you venture into one of L.O.G. 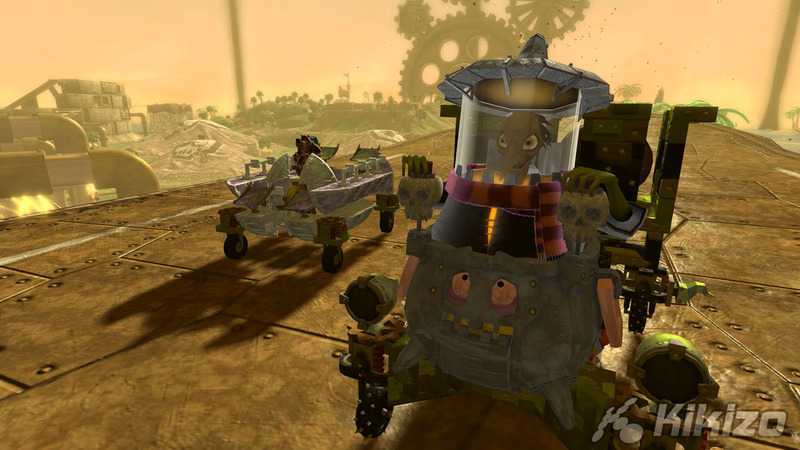 's brain-children the artificial sky's the limit: armoured blimps and rocket-powered hoverships are some of the least eccentric sights you can expect. Creating and piloting these motors isn't just the key to navigating the worlds, which are far, far too sizeable to tackle on foot: the challenges offered by their inhabitants hinge (theoretically, at least) on works of clever engineering. When you accept a challenge L.O.G. will present you with some pre-fabricated, generally reliable options, but you can also access Mumbo's workshop on the spot, tailor-making a motor to the obstacles at hand, and the upper reaches of the tripartite scoring system will fall to those who walk the latter path. The vehicle editor itself is engagingly slick. You can build something from scratch, use a chassis contributed by Mumbo as a template, or fiddle around with one of the fully fleshed-out blueprints sold by his wife Humba. 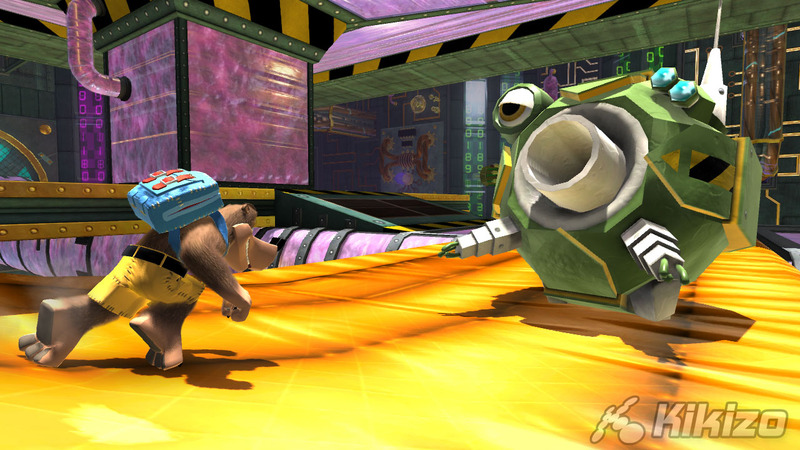 Parts are assembled on a three-dimensional grid canvas: left stick controsl the cursor, right stick moves the camera and the triggers alternate grid levels. 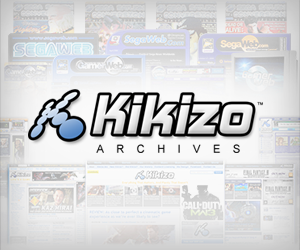 The D-pad changes a component's orientation and the face buttons place or delete it. Parts come in the following easy-to-comprehend flavours: seat, power, fuel, ammo, wheels, body, accessories, fly or float and weapons. 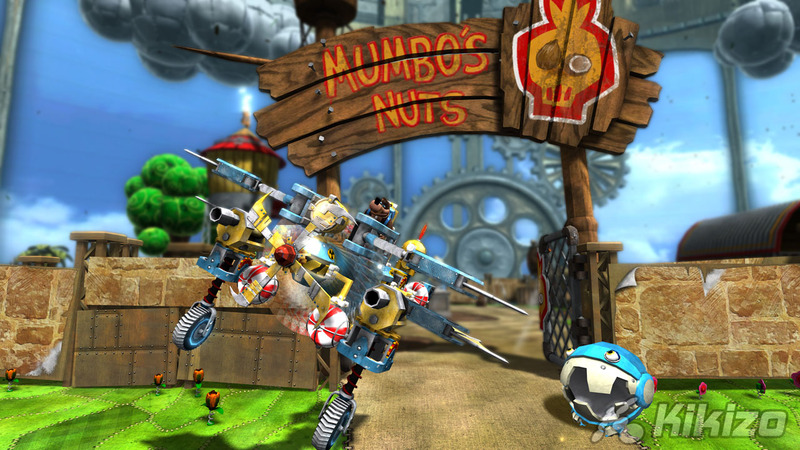 After the steep vertical plunge that was LittleBigPlanet's level editor, Nuts & Bolts' relatively modest variant is rather gentle on the neurones. 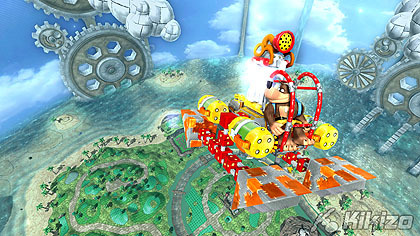 Successfully connected parts are colour-coded green, while those on a different grid level are greyed out, and a scrolling road backdrop helps you keep your bearings. It can be a struggle to see the wood for the trees at times, but assembling something in three dimensions was always going to incur a few problems of perspective. In keeping with the happy-go-lucky tone, vehicle controls are pretty straightforward: right trigger is your gas pedal, left trigger puts you in reverse, and the face buttons activate whatever silly gadget you've bolted onto the fender. The castrated physics system which underpins the proceedings obliges you to keep tabs on such factors as weight distribution, but never demands perfection, opting for big, broad strokes rather than nitty-gritty variables. There's an on/off concept of traction, for instance: either your car sticks to the road 100%, or it zips away like a punctured balloon. Flying looks like it's going to be a struggle, but the minimum air speed is ridiculously low: when you're at the tiller of a propeller-powered boat, it's quite possible to take off by accident. 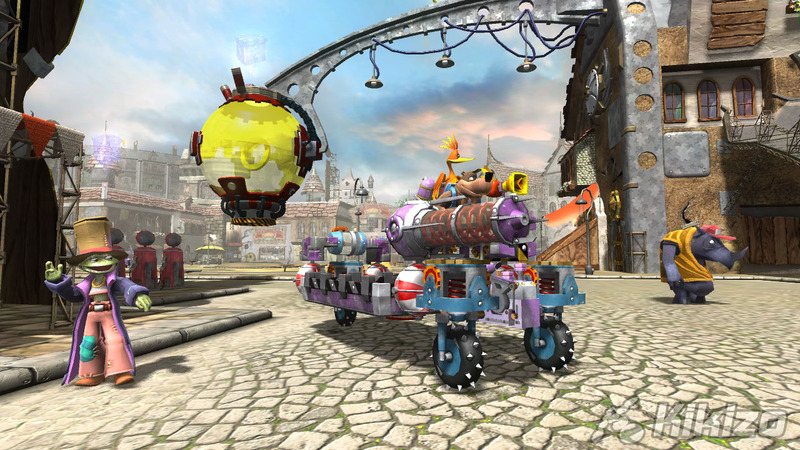 Your vehicle may lose parts if you go head-to-head with Grunty's cackling Gruntbots, but runaway pieces can be magically reattached by holding right bumper.